Somehow, in my years of baking – before, during, and after living in Scandinavia – I had never before made the classic Scandinavian Christmas cookie: pepparkakor, as they’re known in Swedish (spelled pepperkaker in Norwegian), which are thin, crisp ginger snaps. When my friend Liv invited me to take part in a Christmas cookie exchange, I saw the perfect opportunity to remedy that situation. I mentioned in my last post here, months ago, that we were getting ready to leave Norway. It’s funny how sometimes you don’t realize how settled you feel in a place until you leave it; in September we moved to Montréal, Canada, and after several months here we are just now starting to feel at home in our new apartment. It’s been a slow transition, but I’m finally enjoying making food in our kitchen (hurra! ), and I definitely enjoyed baking this classic Christmas cookie. Thanks to the array of spices in this dough, it is incredibly fragrant (it genuinely smells like gløgg, or mulled wine), and cutting out shapes with cookie cutters evokes a childlike glee within me, so how could I not? I’m so happy that Liv introduced me to the idea of a cookie exchange, too. Here’s the basic concept: gather a small-to-medium sized group of people (say, 4-8 people). Each person picks a cookie recipe to bake, and then you bake a dozen cookies for each person in the group. After the cookies are baked, you meet up for a little holiday gathering, and you swap cookies with each person in the group, so that you dole out a dozen of your own cookies to each person (keeping a dozen for yourself), and you receive a dozen cookies of different types from each person in the group. With our group of eight, we each went home with a selection of eight different kinds of cookies, but we each only had to bake one kind. 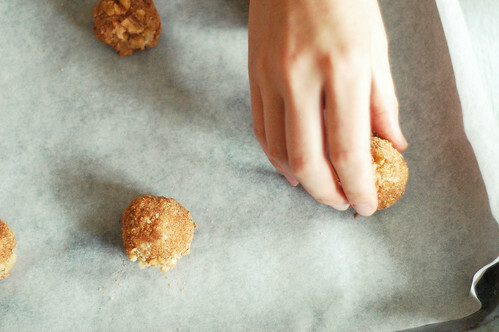 You then have plenty of cookies on hand for holiday parties, gifting, or simply snacking on over the break. Is that not the most genius thing ever? So, as I mentioned, I decided to bake pepparkakor. I looked around at several different recipes – classic as they are, there can be quite a lot of variation in recipes for these cookies. While ginger and cinnamon are basically always included, you may or may not see cardamom, grated orange peel, and even pepper (hence the name!). In fact, during my time in Norway I realized that whether or not pepperkaker should include actual black pepper is somewhat of a perpetually ongoing debate. 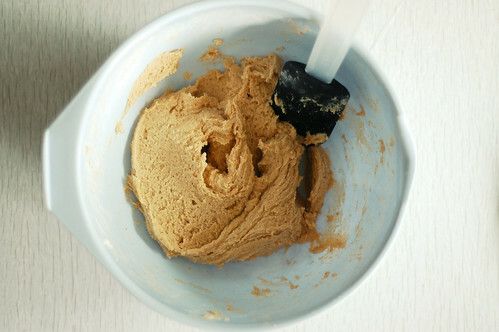 There are also differences in whether recipes use molasses, golden syrup, or something else. In the end I decided to use the recipe from Fika by Anna Brones and Johanna Kindvall. I knew I wanted to use the Dala horse cookie cutters my in-laws gave me a few Christmases ago, so going with a Swedish recipe felt appropriate. This recipe includes ground cinnamon, ground cardamom, ground cloves, and ground ginger. I took the time to grind the cardamom, cloves, and ginger fresh, and I think that truly makes all the difference in the world. These would have been lovely if I’d used pre-ground spices, but they’re truly delightful with the fresh ground spices instead. It also does include a wee bit of black pepper, and I suppose I ground that fresh as well! I decorated a few of the cookies – two per person for the cookie exchange – but pepparkakor are delicious with no frills at all so I left the majority like that. I did have fun icing the few cookies I decorated, though. The stark white icing against the rich brown of the cookies is pretty, isn’t it? If you’re interested in making some pepparkakor of your own, Fika is one of my favorite Scandinavian recipe books and I’d definitely recommend it! Or you could give my friend Daytona’s Norwegian recipe a try instead, as it’s available for free on her blog, Outside Oslo. Now that Easter is approaching, what better time to write about a treat traditionally consumed on Shrove Tuesday? (I’m poking fun at my own tardiness here, *wink, nudge*.) I first learned about fastelavnsboller, or semlor as they’re known in Swedish, from a Sweden-loving friend who was visiting Seattle and wanted to know if I knew where to find any. I hadn’t heard of semlor, so I sadly didn’t have any advice, and I also had no idea at the time that they were associated with the period before Lent – although today, in largely secular Scandinavia, they are often consumed throughout the first few months of the year by many without regard to the Christian calendar. Nonetheless when the weekend before Shrove Tuesday rolled around, I decided that I wanted to make myself fastelavnsboller for the first time! These treats are essentially cardamom boller that have been cut open and filled with something delicious. Some versions have you scoop out a little bowl from the bottom piece, and you combine the bready filling with almond paste and add it all back to the bun, topping it off with whipped cream before the little top goes back on. Other versions skip the almond paste step and just add whipped cream (I opted for the latter). Both versions are super delicious. 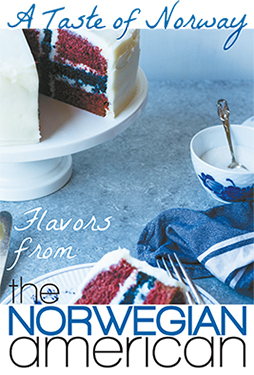 My friend Daytona’s recipe for the Norwegian American will tell you how to make both versions, and this is the recipe I used. My fastelavnsboller are yet another illustration of how I am sometimes a makeshift baker. I halved the recipe, and assumed I had enough all-purpose flour for a smaller batch – but it turned out I didn’t. So I added in a little bit of rye flour at the last minute, which obviously made for a slightly heartier bun than normal (but to be honest, I actually kind of enjoyed it). I still had fun making these and I absolutely loved whipping up the cream and dusting it all with powdered sugar at the end. Whether during Shrovetide or not, I think everyone should try these at least once. You can find the recipe for these buns (for free!) over at the Norwegian American’s “Taste of Norway” section. Thank you to Daytona (of Outside Oslo) for such a wonderful recipe! 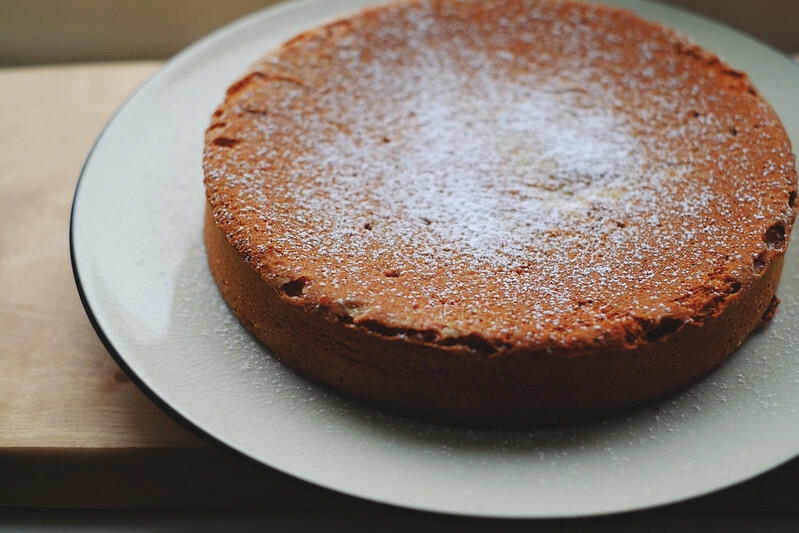 It’s been a little quiet on this blog but this time, it’s not because I haven’t been baking! It just turns out that a lot of things fall by the wayside when you’re also writing a master’s thesis. So I’m working to catch up on a few things! One Saturday in February, my friend Anna came over for some tea and knitting in the afternoon. We’d both been feeling the winter blues a little bit, but these thumbprint cookies from Fika, called syltgrottor in Swedish (or “jam caves”), definitely helped raise our spirits. Fruit and jam types of cookies were never my favorite growing up – I wanted rich chocolate in my cookies basically all the time – but as an adult I’ve really come around to them. This recipe calls for Queen’s jam, which there’s a recipe for in Fika – it’s a jam with equal parts raspberry and blueberry. I didn’t have any of that, however, so I just used plain old raspberry jam. It was still absolutely delicious, but with the subtle anise flavor of these cookies, I can see how the flavors of the Queen’s jam would be a winning match! These cookies are meant to be baked in small paper liners, but I spaced out and forgot to pick up any at the store when I bought ingredients, so we just baked them right on a baking sheet with parchment paper, which worked absolutely fine. I’d love to give them another go with paper liners, however. 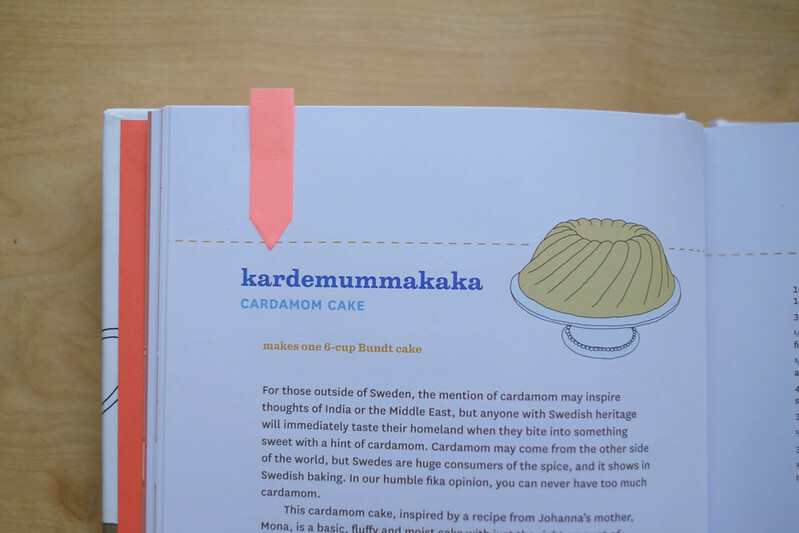 Fika continues to be one of my favorite baking books, one that I reach for most often now. And I can definitely see myself making these again. Do you have a favorite type of thumbprint cookie? 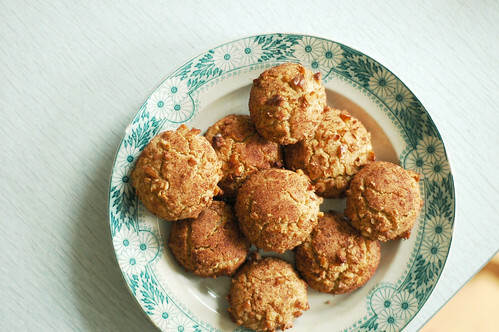 You can find the recipe for these cookies in Fika by Anna Brones and Johanna Kindvall. And a quick P.S. for anyone who enjoys Scandinavian design as much as I do! The authors of Fika are both talented artists, and Anna has just started the 100 day project on her Instagram with the goal to make one papercut piece every day for 100 days inspired by classic Scandinavian design (be still my heart!). 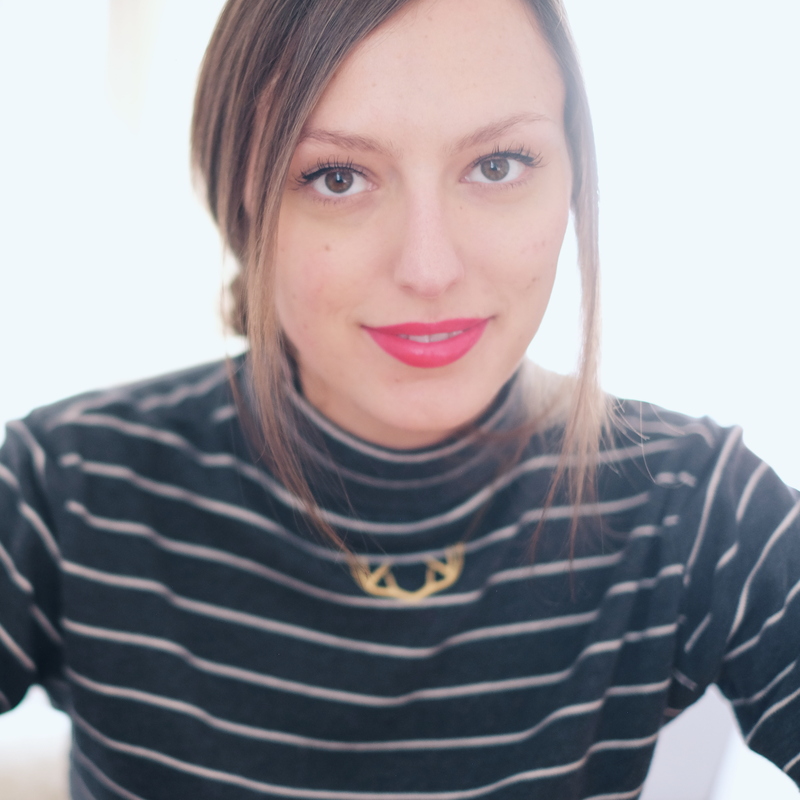 You can check out the first post here (she kicks off with Stig Lindberg’s Berså), and be sure to follow Anna if you want to watch the project unfold. There’s a very narrow window here in northern Norway when the grocery stores have Norwegian apples available, rather than the (pretty sad) imported ones we find throughout the rest of the year. My husband and I were delighted to find that we could find domestic Gravensteins at the store when this window opened last year, so when it came around this time, I thought it’d be the perfect opportunity to bake an apple cake. The recipe calls for a springform cake pan, but my Norwegian kitchen is actually still lacking a lot of baking equipment and a springform pan is not part of the equation. My regular cake pan did just fine, however – I greased and floured it well and the cooled cake popped right out in one piece. I probably don’t need to tell you that the cake itself was delicious – it’s hard to go wrong with this mix of ingredients, after all. Despite the amount of brown sugar and plain sugar that went into it, it wasn’t overly sweet. It’s kind of the perfect fika cake, to be honest. I might have to make this one again before the domestic apple window closes. 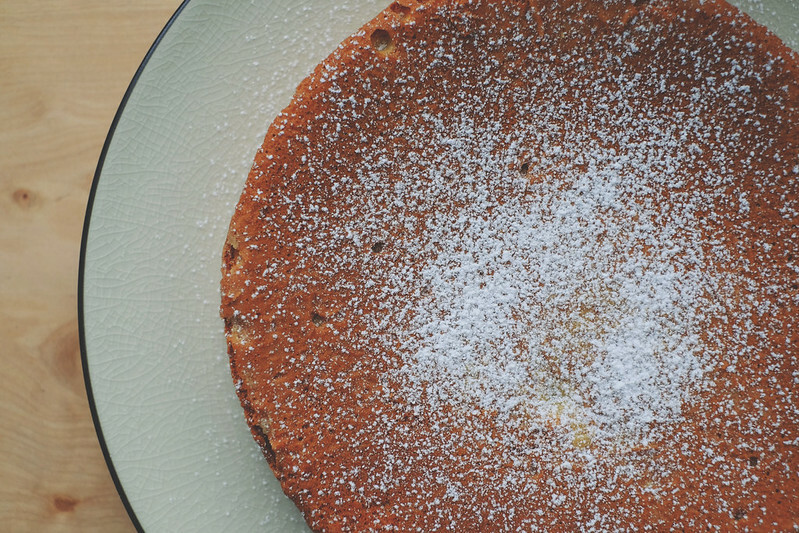 You can find the recipe for this cake in Fika by Anna Brones and Johanna Kindvall. I’m back in Tromsø after spending Christmas break in Seattle, but it was such a busy month with so much work and (literal) housekeeping to do that I didn’t have time to do any Christmas baking (boo). 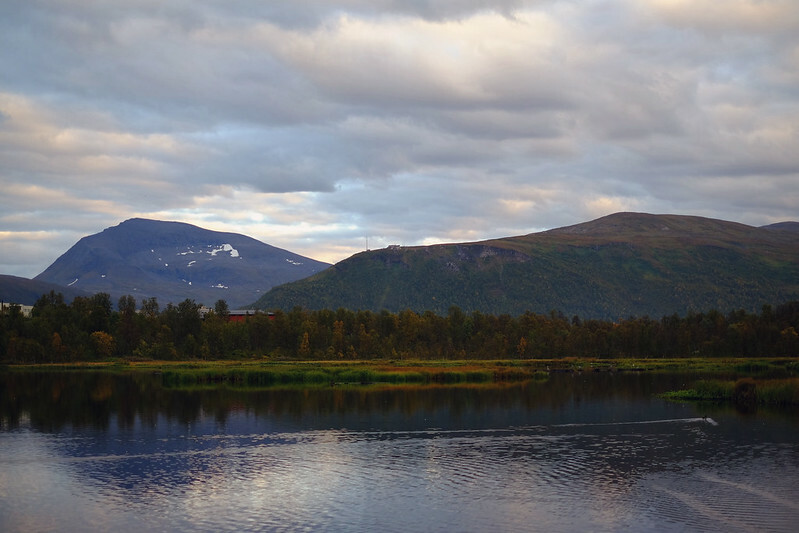 It’s been quite cold in Tromsø since I got back, however, which is the perfect excuse to be baking – nothing warms up the house like a hot oven, you know? 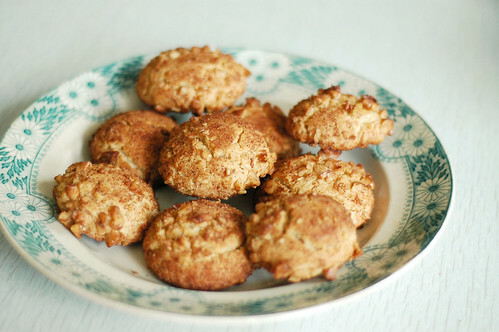 Since moving to Norway I’ve become rather obsessed with a certain local company’s havrekjeks – that is, oat cookies. They’re the perfect crisp and crunchy consistency with chocolate chips and I love them. 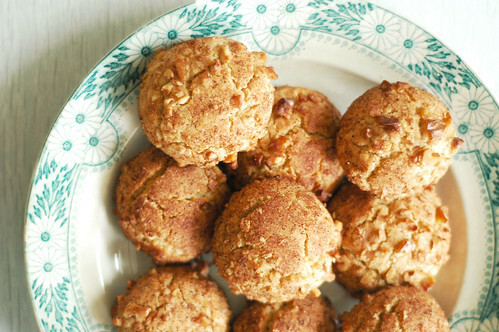 I thought it’d be fun to find an oat cookie recipe to try from my Nordic cookbook library (so that I don’t spend all my money on Bakehuset’s cookies). I picked out the havreflarn med choklad from Fika, the book I introduced in my previous post. Unlike Bakehuset’s havrekjeks, these cookies don’t have chocolate chips, but they do form a cookie sandwich with a chocolate filling. This was a very straightforward recipe, with a few prep steps (my rolled oats needed to go through the blender for a minute to bring the size down, and the chocolate for the filling has to be melted once the cookies have cooled) but mostly instructions along the lines of mixing everything together and dropping dough on the cookie sheets. I made my cookies too big at first, which took me a little while to realize. I also stacked up my baking sheets in the oven, which meant that the cookies on top achieved the idea crunchy crisp consistency I was going for while the cookies on the baking sheet below stayed a little softer (still crisp, but with a softer texture, if that makes any sense). In the photos, the cookies that were on the bottom rack have a smoother texture with larger bubbles. The wild card in this recipe was that the chocolate filling contains ground ginger. I love ginger, but after making these cookies, I don’t know if I love ginger with chocolate. I feel like I might swap the ginger for cardamom next time I make these. Or perhaps I’ll skip the chocolate filling altogether and throw chocolate chips into the dough instead! Ginger aside, this was a really great basic recipe for oat cookies that I’ll happily make again in different iterations in the future. Fika, by Anna Brones and Johanna Kindvall. My friend Daytona told me about this book earlier this year and I ordered a copy shortly before we packed up our container in May for the Norway move. I was so excited to get it, but I opted to put it in one of the moving boxes so that it’d be here in Norway once we flew over in August. So I had a few months to wait before I really got to sit down with it! Fortunately, it was worth the wait. 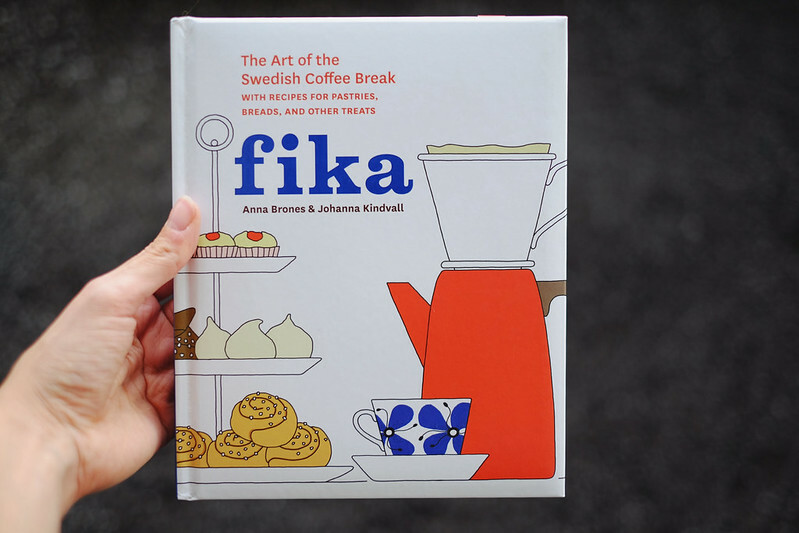 As you might assume, this recipe book is all about fika, the beloved Swedish custom of the daily coffee break (with treats). I love the size of this book and I love the aesthetic, too – instead of photos, the book features adorable illustrations. 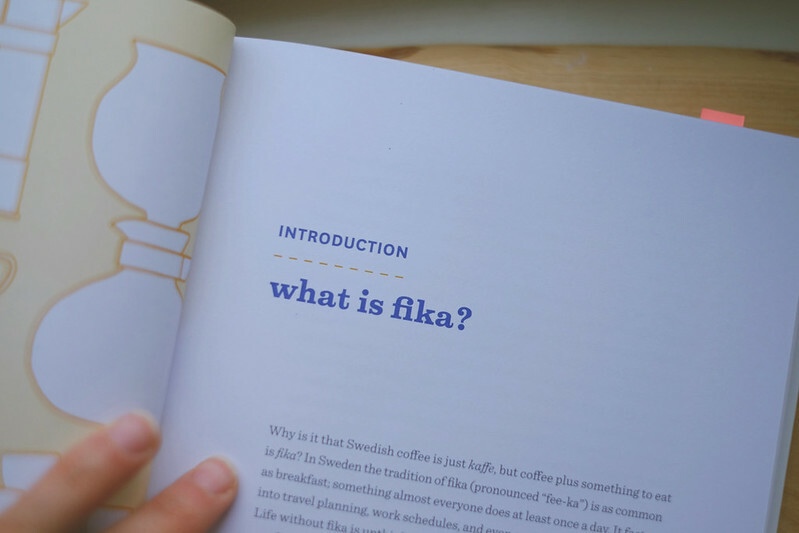 It also features a lot of great background info, like exactly what fika’s all about, a history of Swedish coffee, pantry staples you’ll want to have on hand for the recipes, and so on. It’s straight up my alley. I had a hard time trying to decide what I wanted to make first, but in the end I settled on a cardamom cake. I love cardamom (don’t we all?) and I guess I was craving a cake. This one ended up being a lovely breakfast treat for a few days (it goes well with coffee, after all). It’s simple to make, and the end result isn’t too fancy, but it’s delicious and elegant enough to make for a special occasion, as well. The recipe called for a bundt pan, which I didn’t have, so I just used a normal cake pan. I quite like the result. Inside, the cake was spongy and fragrant, sweet but not too sweet. Just right. To keep it unfussy I topped it off with a dusting of powdered sugar. A bundt pan would definitely dress this simple cake up, but it’s nice to know it works well as a simple shape, particularly as a fika treat. I’m very much looking forward to baking more things from Fika and with the weather cooling off in Tromsø, I’m sure there will be lots more baking in the near future. Here’s to kitchen number seven! I have long had an aversion to walnuts in baked goods, largely because I can’t stand walnuts in two of the most basic American baked goods there are: brownies and chocolate chip cookies. They’re very polarizing in these two cases; some people love them, some detest them. I’ve always fallen into the latter camp. I think walnuts will always ruin what is otherwise a perfectly delicious brownie or chocolate chip cookie. I never wanted them in muffins, either, no matter what kind of muffin. I don’t dislike walnuts as a rule. Growing up, the stuffing my mother made for Thanksgiving dinner every year contained walnuts, and it was often my job to crack the walnuts open as we were prepping. I enjoyed this task immensely, and I often enjoyed snacking on the walnuts, too. To this day, whenever I eat walnuts on their own, the smell and the taste take me straight back to sitting at the kitchen table on Thanksgiving morning with the parade on the television, cracking open walnuts as my brother and I helped mom prepare for dinner. The good news is, I’ve found a cookie with walnuts that I really, really like: Swedish Cinnamon-Walnut Cookies. I’m in Oslo for the summer, and it’s largely been a very warm, very sunny summer. The weather’s finally cooled off, though, and some rain systems have moved in, so my friend Alex (the same one mentioned here) came over to bake with me yesterday. We decided to try these cinnamon walnut cookies – it’s a very simple recipe which doesn’t need very many ingredients, so we were mostly stocked up already. I also had some pretty divine French butter I bought at Mathallen that I thought would work quite well (when ingredients are few and simple, it always pays to use the best quality ingredients you can). As it was a Sunday (most grocery stores in Norway are closed on Sundays), I popped down to the local greengrocer/import store which was open to see if they had any vanilla extract. They didn’t, but they did have vanilla bean – and as it turns out, if you scrape out the seeds from the bean, you can use those as a substitute. It’s a much lengthier process than measuring out a teaspoon of vanilla extract, but the cookies definitely didn’t seem to suffer as a result. Alex and I simply dispersed the seeds in a small bowl with the egg (the closest thing to a liquid ingredient) before beating it into the dough. I think using the nice French butter really paid off. The dough alone was exquisite. And as I mentioned, very few ingredients were needed: the dough was made from butter, sugar, flour, egg, cinnamon, and vanilla. After the dough was chilled for 30 minutes, we pulled it out of the fridge. 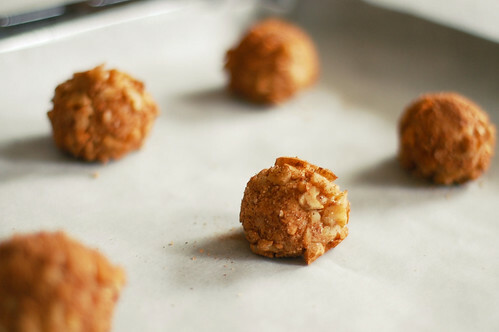 Small pieces were rolled into balls, which were then rolled in a blend of cinnamon, sugar, and chopped walnuts, and then placed on the baking sheet. The balls of dough flatten out into the loveliest little domes in the oven. 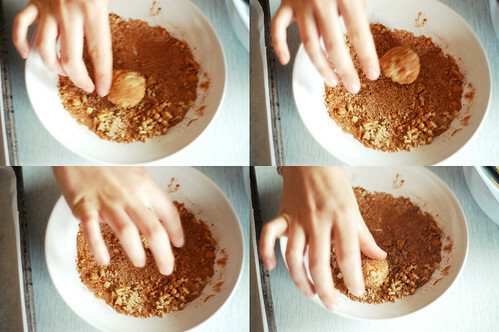 The resulting cookie was something like a snickerdoodle, but lighter, fluffier, and covered in walnuts. They were delicious. These would make a perfect Christmas cookie, and I’m already looking forward to making them again during the holiday season. I’m very pleased to have found a walnut cookie I love.